Until recently, I had no idea that summer ramen even existed. 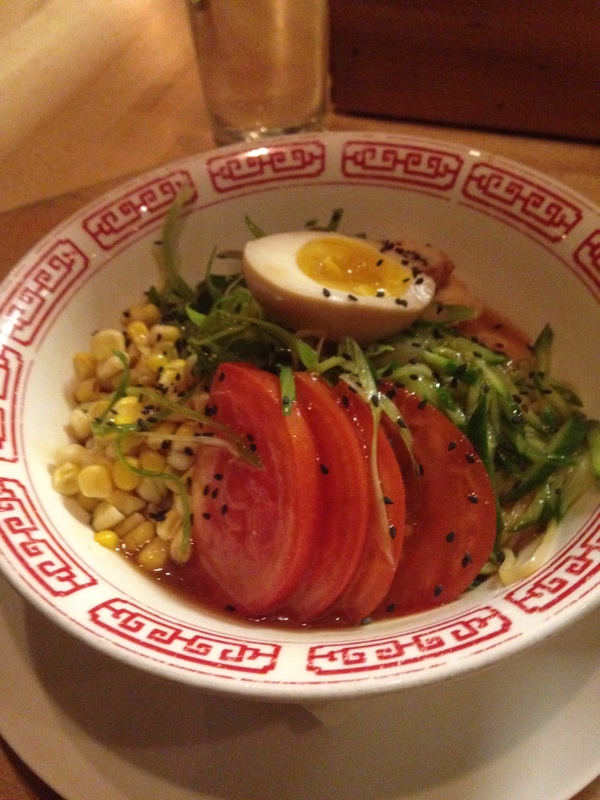 Luckily, thanks to an email from Tasting Table NYC, I learned about Ganso, a ramen restaurant in Boerum Hill, Brooklyn. I love noodles and soups, so I just had to try this dish. Located next to the Hoyt-Schermerhorn G stop (and about a half dozen others), Ganso is a small restaurant with clean lines and wooden paneling throughout. I sat at the bar (more like a sushi bar than a drinks bar) where I could see the chefs in action. 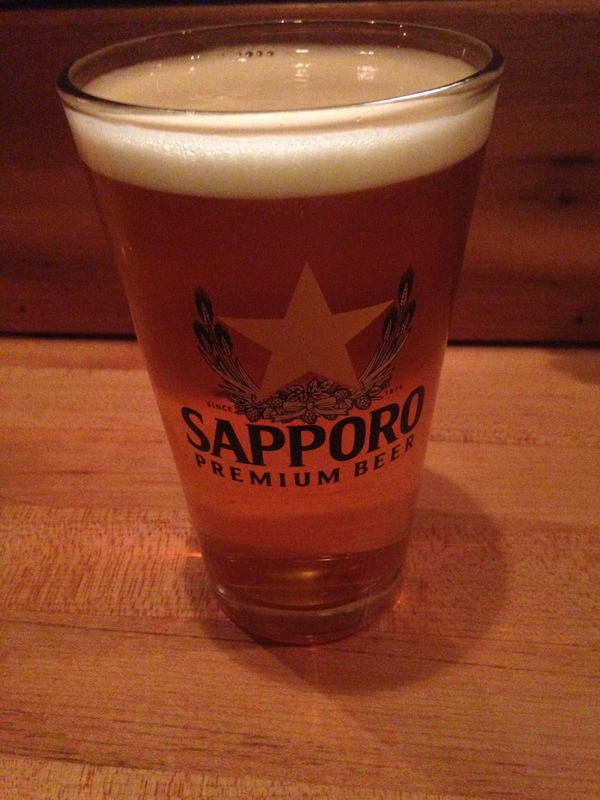 I started out with a Sapporo, which they have on tap. Although the drink menu is limited to beer and wine, they did seem to have an extensive list of sake. I was hoping for a summery cocktail, but Sapporo is always refreshing. Here is the summer ramen before I dug in. 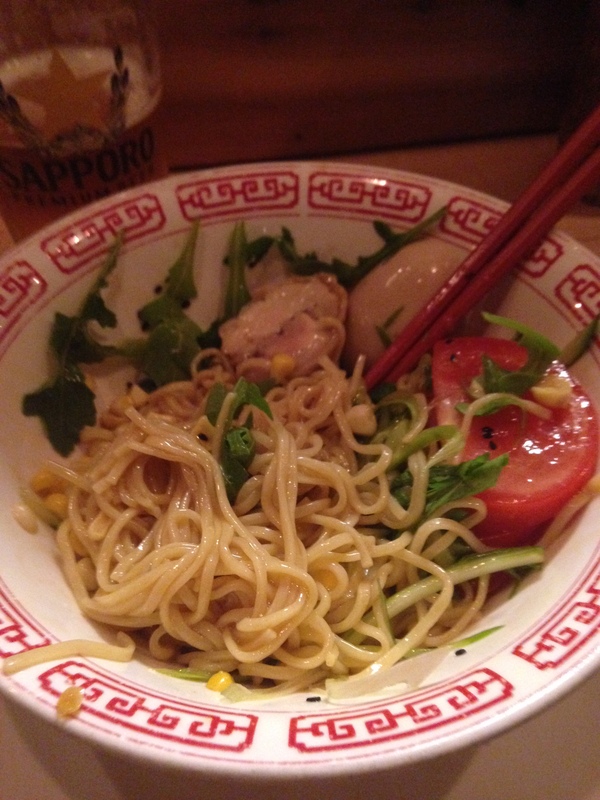 The noodles were topped with fresh tomatoes, corn, cucumbers, greens, pork slices, and an egg. I really loved all of the bright colors. After eating my way through the greens, the noodles emerge. I was really reminded of the taste of a seaweed salad. If that is a taste that you like, you will really like this dish. It was very different from ramen soup, not only in that the noodles were cold but I could taste the vinegar and yuzu sauce they were soaking in. Eating the noodles and corn with chopsticks was a bit of a struggle for me, but I managed. This had such a great, unique taste to it that I didn’t even miss the soup-ness of typical ramen. After the meal, the check was delivered on the postcard that you can see at the top of the post. I felt like the $14 price tag was a bit steep, but it was very filling and a seasonal dish. I don’t know that I loved it enough to order it again, but it was worth the experience. The service was fast and friendly. Next time I am craving ramen, I would visit Ganso again, especially given how convenient it is via subway..